I use a film changing bag to load the film on to the spool and into the tank. If there is one thing i have learned about this process it is to avoid small film changing bags. I had mine made in Jordan for 10.00 GBP but you can buy one on ebay for about twice that (65 cm x 65 cm). A smaller bag is workable but the height of the tank compresses the “free space” and you may end up struggling with it (as I did). Plus your hands can get hot (quickly): sweat and film are not a good mix. Buy a proper film can opener. Yes, you can pull the film back through the felt strips (if you left the leader out) but the film has already made that trip twice and there is a risk of damaging the emulsion if there is any micro-grit/debris on the felt. When the requirement comes to cut the film from the spool, use small yet sharp scissors for cutting the film straight with one cut. All of this equipment is readily available off the shelves. What isn’t available commercially is a little tool I’ve made to help keeps the film straight going onto the reel. 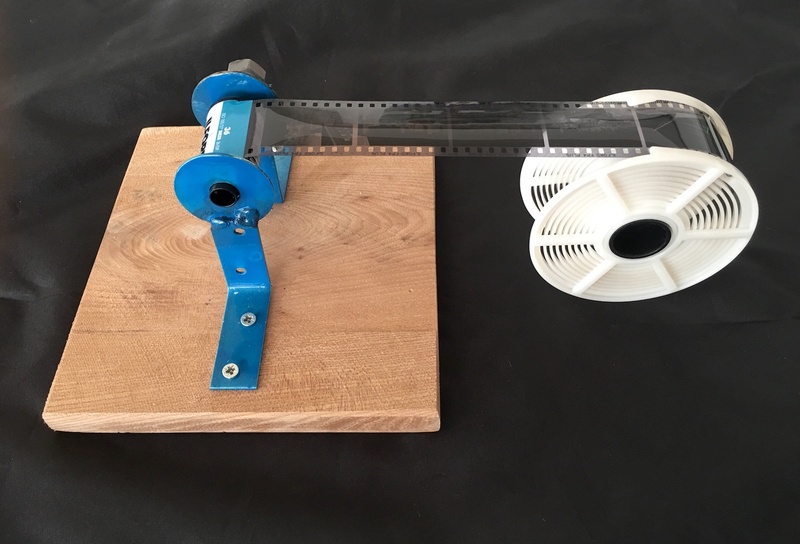 I have made several film spoolers in the past (latest version below) – you could probably make one out of lego, wood or plastic might also do. My latest version has a side-bolt so I can can adjust the spooling tension (“goldilocks tension” means you just ratchet the reel and the film feeds in nicely). Without the spooler you may have to multi-task and keep adjusting the “feed” into the reel – the less your hands need to move the better. This photo is just to help give you an idea of how the setup works. 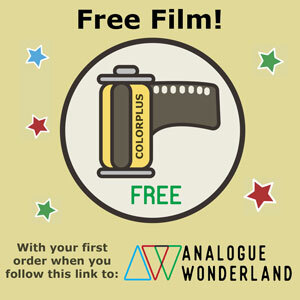 As mentioned, in practice the film is not contained within the canister – it’s also (obviously) not already developed… Hopefully you the gist: “hands-free” with tangential film exit & entry: 30 seconds of “jiggling” to complete the task. The most critical item is the reel. Mind you, I have never tried anything other than the Paterson that I own; it works, and I suppose alternatives could be better/easier, but I don’t want to accumulate more equipment (“use what you got”). I clean the reel with a toothbrush and fairly liquid after use, rinse, and leave to dry – it must be perfectly dry if you want to avoid it getting jammed when loading. I then jiggle the two ball bearings back and forth with a compass point to make sure they are truly free – if they are not you may have problems with the next film. In preparation I lay everything out in the same place every time – on top of the bag as a visual check. I then put it all inside in the same positions – groping around in the dark soon becomes a thing of the past. Tip: Remove you watch before inserting arms in the bag. I shan’t double up on the Parallax post. 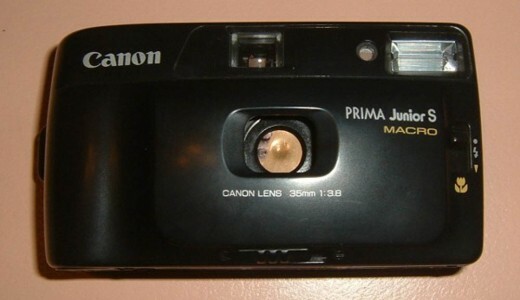 The only difference for me is loading the film into the spooler before picking up the reel and inserting the film end. Just remember to clean and dry everything thoroughly when done, and shake out the film bag. If there are alternate/better methods of handling let me know? New tricks always welcome here! Born and raised on a farm in Yorkshire. 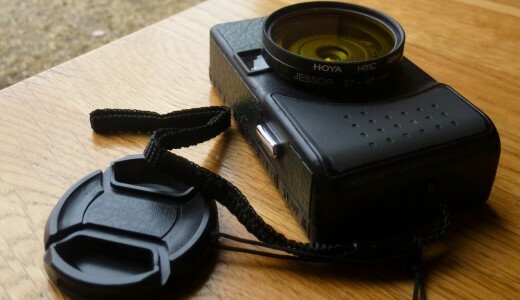 My father is an Olympus fan and I still have his OM2. I studied mechanical engineering with great pleasure in Coventry and Cambridge. I joined Schlumberger Wireline & Testing in ’92 and went overseas in ’94 (Middle East). I’ve been a consultant with Gaia since ’03, working all over the place (Trinidad to Mozambique, via Syria and back again). I continue to tinker with the things that interest me (e.g. I’ve been trying to solve cable sticking in oil wells for the last 9 years – getting there now). My favourite part of the world remains East Africa (always fun and rewarding); I guess I’m wired for that sort of environment. The people I admire the most are those who flourish in the non-corporate creative industries – such folks are driven by their heart and not the dollars (of course the challenge is in monetizing one’s passion). I like motorcycling a great deal – as Spencer Conway said during his epic African Motorcycle Diaries “In a car you’re watching a movie, on a bike you’re in the movie”. Bike, camera, and an open road is the ultimate “freedom package” in my view. I have to admire your ingenuity, Guy, but I seem to be reading everywhere nowadays, and something that I can’t really comprehend, why is it people find it so difficult to load a film onto a reel? Yes, remove the film from the cassette, yes, ensure that the reels are scrupulously dry, yes, have a medium to large changing bag, but once the little knack has been learned, and it isn’t rocket science, about introducing the film onto the reel, actual loading thereafter is automatic by a simple jiggling of the reels. And, as I’ve alluded to in another post, for anyone who has any concerns about doing all this in the dark, why not search for a Jobo 2400 daylight loading tank? Just remember to leave the film leader out when rewinding, it still needs this, but if one uses an auto rewinding camera, it may completely rewind the film. In this case, use a little film leader retrieval too and with a little practice, and patience, the leader will come out. Without a spooler I’ve had problems getting consistent smooth film transfer (infrequently so, but when there’s a problem it’s quite vexing). Not worth the potential hassle for me, even if 1 film snag in 20. Jobo sounds interesting, one film at a time though no? 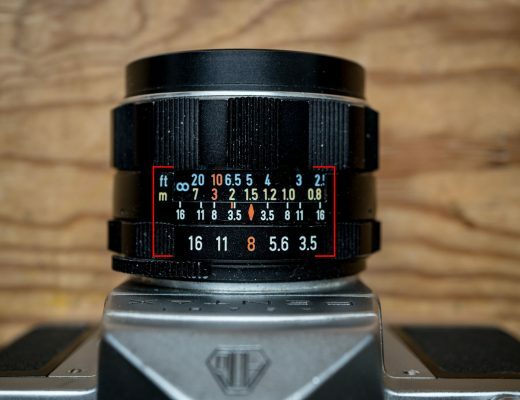 Guy, yes, the Jobo 2400 is only one 35mm film at a time. This could be its only downside if throughput is important. And it doesn’t overcome the necessity for completely dry reels, either. I used it in tandem with the earlier Paterson System 4 tank as I was never a fan of developing two films together. Call it caution, if you will. The 2400 is likely to find favour with those trying out developing their films for the first time and want to avoid the potential hazard/pitfall in loading a conventional tank in total darkness.. I agree with your comments about loading direct on to the reel. I’ve had few instances of the film (35mm and 120) sticking part way through the loading process, but I’ve been able to separate the reel and start again. Film is remarkably robust – I’ve only had one instance of a ‘fold’ in a 120 film which was ‘healed’ when at the scanning stage. 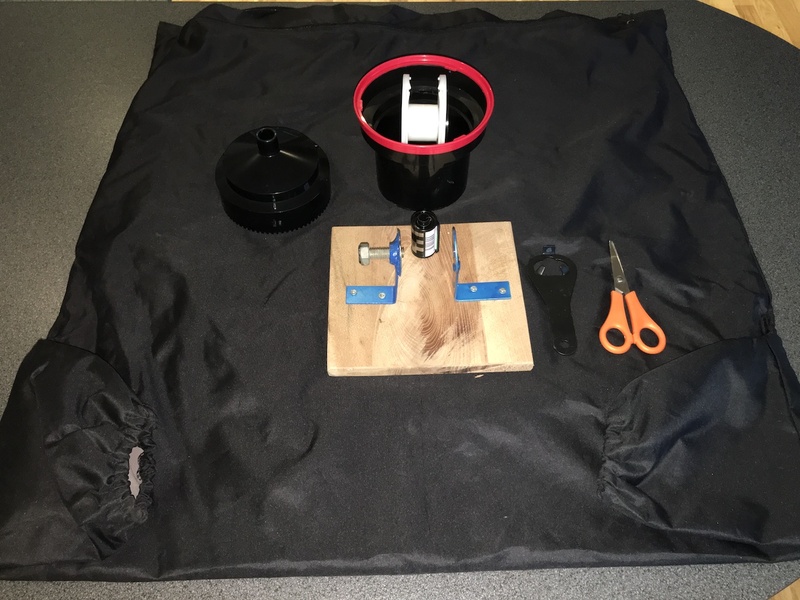 I’ve found it VERY helpful to have another object inside the changing bag – a second dev tank if you one, coffee tin or a cardboard box – anything that will create more working space within the bag. Also, avoid trying to load the reel in hot or humid conditions – that’s certain to result in the film sticking part way through the loading process. In a little confused. You suggest to remove the film from the cassette to reduce scratches to the emulsion but your film holder contradicts this. Which method do you personally use? I used to have a lot of trouble loading film on to the spiral (Jobo) until I started consciously cutting off the leader with a slight curve. 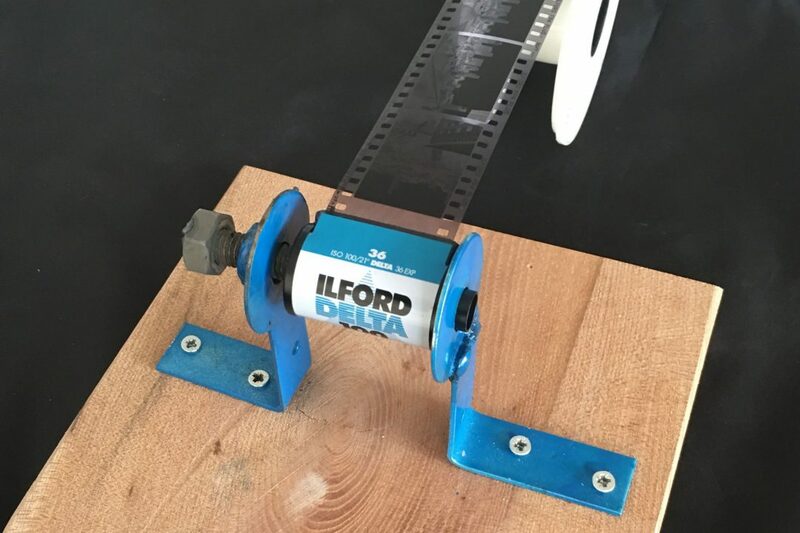 It was too difficult cutting a straight line that was perfectly perpendicular to the film, and some cuts would result in stubs at the sprocket holes that would bind on the reels.